My son Tre was born in Carthage, New York on November 3, 1999. He wasn’t very active before birth but around 10 pm every night he would roll in my tummy and go back to sleep. The interesting thing at 10 years old he goes to sleep every night at 10 pm no matter what we are doing as long as he isn’t sick. I went to work out at the gym one day when he was three months old while my husband babysat. I got to the gym and an announcement came over the intercom saying that I needed to come to the front desk to answer the phone. I went to the phone and my husband said something was wrong with Tre and I needed to come home. I quickly went home and saw Tre on the bed shaking. I took him to the Army emergency room. We were told that a bottle of Pedialyte should do it. I went home gave him some Pedialyte and he started shaking again. We went to a different hospital and they said he was having seizures and sent him to a bigger hospital in Syracuse, NY. 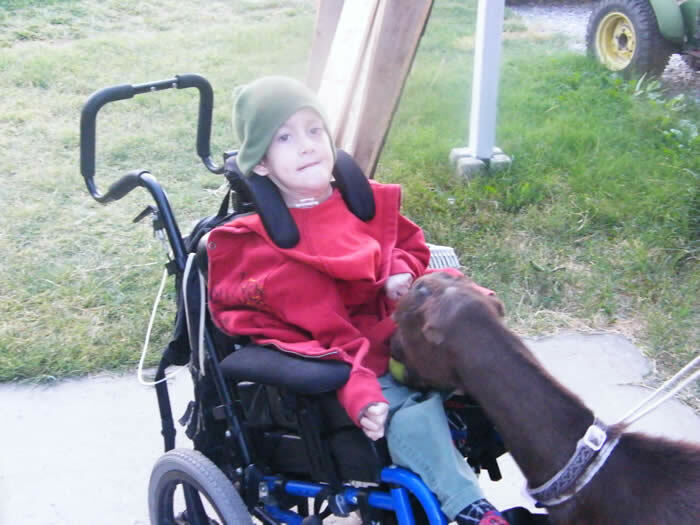 He was treated for months like he had seizures all the time, which he didn’t, after those two he never had another one. He was prescribed Phenobarbital but in our hearts we never thought he had a seizure disorder so we never gave it to him. The Doctors threatened us because we were going against their advise and endangering our child. He was sick a lot but never with the “seizures”. He was eventually diagnosed with hypoxia-in-utero. For two years that is the diagnosis everyone went with, all the while trying to figure out why he would always vomit every type of formula he was given. When he was two years old he was 12 pounds, realizing he was 9 pounds at birth. We were stationed in Pocatello, Idaho. He got sick and the pediatrician looked at him and looked at all the blood work and his extensive chart and said something doesn’t jive. She said before she was a pediatrician she was a chemist and something didn’t look right. She referred us to a Dr. in Salt Lake City. He ran the same tests we have been running for the last two years so I was getting frustrated that we had to start all over again. I felt like we were getting nowhere and in the mean time my son is withering away to nothing. We went home and learned nothing new. I had so much hope when the pediatrician said something was off and excited to go to this new Doctor with the answers just to poke and prod my son all over again to find nothing out. A week later we got a call. It was 9 am on a Saturday morning so I didn’t expect the voice on the other line. It was a Doctor. Great, I thought, a Doctor’s call on a Saturday morning must mean he is calling to say my son is going to die soon. Well, he didn’t say that he had great news, but that my son had a metabolic disorder called Glutaric Acidemia Type 1. This is great news to me because now I can stop watching my son die, there is something we can do now. There was not much on the internet and I was like a lonesome vampire, with no humans around to extract anything from. We have volumes of medical records and a spare bedroom full of medical supplies and a heap of bills. Nobody mentioned all that when they give you a diagnosis. (even though the bills are implied). It was a long haul since we were so far behind and it takes so much longer to catch up than to get behind. We obviously still struggle to keep up but he is doing well now. For now we have things under control and he is gaining weight and it only took ten years. I have had so much fun and experiences both bad and good that I have found a new person in myself. I have learned more about myself faster than most do. When you have to fight, argue, cry and go through the trials that we do, it shows you what you are really made of. I have invented a wheelchair that can go into the forest to get kids out and see all the beauty. Tre has done this for me. It is a pleasure to have him in my life. I can go on forever about my kids so I will stop here and hope and pray everyone is enjoying their children as much as I am, they deserve it.